Absorbent Mat and Wipers are packaged in dispenser box. Suited for workbenches, workstations, tool carts, lab tops, or any area prone to small spills and messes, PIGÂ® Mat and Wiper Combo Pack contains 1 roll each of PIGÂ® Universal Mat and PIGÂ® All-Purpose Wipers for on-the-spot cleanups and wiping tasks. PIGÂ® Mat is light-weight and soaks up small leaks, drips and spills, while abrasion-resistant PIGÂ® All-Purpose Wipers are used to wipe down machines and rough surfaces, and are soft enough to wipe hands and face. Tipton, PA- May 21, 2008 -- New Pig Corporation has introduced the double-duty PIG® Mat and Wiper Combo Pack for fast, on-the-spot cleanups and wiping tasks. 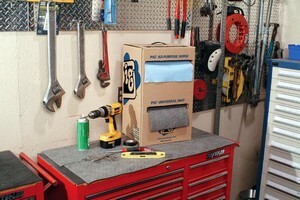 Packaged in a unique dispenser box, the PIG® Mat and Wiper Combo Pack contains one roll each of PIG® Universal Mat and PIG® All Purpose Wipers - with simultaneous access to each product. 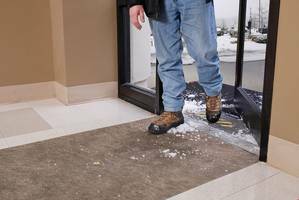 The light-weight PIG® Mat soaks up small leaks, drips and spills and the versatile PIG® All-Purpose Wipers are soft enough to wipe your hands and face but also strong and abrasion-resistant enough to wipe down machines and rough surfaces. The PIG® Mat and Wiper Combo Pack is ideal for workbenches, workstations, tool carts, lab tops or any area prone to small spills and messes. In 1985, New Pig invented the first contained absorbent, the Original PIG® Absorbent Sock, changing leak and spill management forever. Built around its award-winning Pigalog® catalog, innovative product line, and legendary service, the company has thrived. 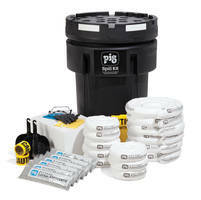 Now a multi-channel, multi-brand supplier of innovative liquid management solutions and industrial maintenance products to industrial, institutional, and government facilities in over 40 countries, PIG® products, services, and technical expertise help workplaces get clean, stay clean, and save time and money. For more information or a FREE Pigalog® catalog, contact New Pig at One Pork Avenue, Tipton , PA 16684 or call 1-800-HOT HOGS® (468-4647). The company's e-mail address is hothogs@newpig.com and website is www.newpig.com.